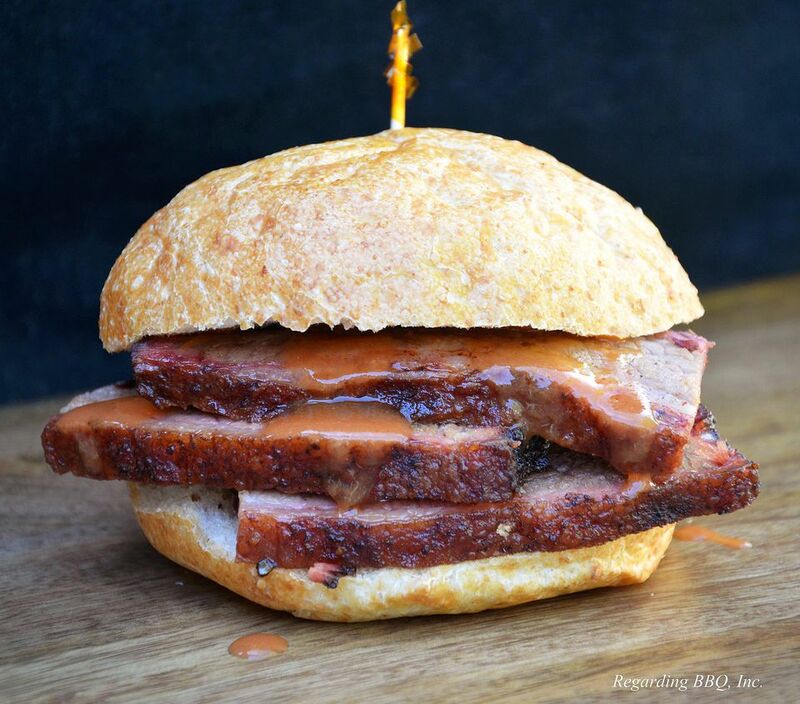 Brisket Sandwich. Regarding BBQ Inc.
Brisket is considered the most challenging barbecue. This huge, tough cut of meat takes hours and hours to smoke to perfection. This means a tender, flavorful slice of perfection and has bold flavors and simply says, this is barbecue. This method for smoked brisket is straightforward and while it will take some time, it is easy as long as you know your smoker and have the patience to let it reach the right temperature. The brisket for this method is a large, completely untrimmed chunk of beef. It should be over 12 pounds and have a lot of fat. If you can't find this cut, ask your butcher. If he doesn't have it, find another butcher. This process Can take up to 24 hours start to finish, depending on the path you take so plan accordingly. Continue to 2 of 12 below. Untrimmed Brisket. Regarding BBQ Inc.
A large, untrimmed brisket will weigh between 10 and 20 pounds, depending on its preparation and place of purchase. A smoked brisket will render half its weight during this process, meaning if you bought a 12-pound brisket you will get about 6 pounds of meat once it is cooked. This is caused by shrinkage during cooking and the loss of a lot of the fat, much of it from trimming. Knowing your brisket is very important. On one side is a thick layer of hard fat. There is another layer of fat that runs through the middle on the thicker end of the brisket. The large piece of meat that runs along the bottom is called the flat. The meat towards the top side (fat side) is called the point. These two pieces of meat run in different directions and present a challenge when it comes to carving. So, examine your brisket carefully and we'll get started. Continue to 3 of 12 below. Trimmed Brisket. Regarding BBQ Inc. Looking at a large, whole beef brisket can be a little intimidating. This big mass of fat and meat is probably the largest single cut of beef you've ever tried to cook. To get it ready for the smoker, the brisket must be cleaned and pared down to a more manageable size. Now, I'm not suggesting that it be cut up or all the fat carved off, but it is easier to work with when properly prepared. There are a few places to conduct this clean-up process. I start by going over the beef brisket and removing any loose pieces of meat or fat. A thin strip of meat hanging off the side is going to dry up and overcook, so there is no point in keeping it. Once you have the loose pieces off, flip the brisket over on the meatier side. Here you may find pieces of the membrane similar to that on a rack of BBQ Ribs. While it isn't necessary that you remove all this, I do find that it can block flavor and smoke from getting into the meat. Now, there is the fat. A whole beef brisket has a lot of it, too much in some places. If you know anything about smoking brisket, you know that the fat helps keep the meat moist during cooking and adds flavor as it slowly breaks down. Now the most important fat in your brisket is not the big pieces on the fat cap (the fatty side of the brisket), but the fat inside the meat. These are the small ribbons of fat in the meat that will do the most good. I am not saying that you need to remove all the fat, but you should cut away some of the large, thick pieces. Don't cut down to the meat, just carve off the excess. By doing this, you can reduce the weight of the brisket by a pound or two and thereby reduce the overall cooking time. It is this final weight that you need to use for your cooking time. Continue to 4 of 12 below. Rubbing Brisket. Regarding BBQ Inc. It takes a long time to smoke a beef brisket, so you and your brisket need a good nights rest before getting started. This is the perfect time infuse flavor into the brisket. Apply a good rub, wrap it tightly in foil, and put it away in the refrigerator overnight. This way the meat is ready to go straight to the smoker. When applying your BBQ rub to the brisket, don't worry about getting it on the fat. Aim for the exposed meat since that is where we want the flavor. Apply as much rub as will stick. The meat holds what it needs. When applying rub to the brisket, do it on a large sheet of heavy duty aluminum foil (the 20-inch wide is the best). This simplifies the process by allowing you to wrap it up with all the rub inside and storing it in the refrigerator. The moisture from the brisket is going to turn the rub into a paste that will help it stick to the meat and help it absorb the flavors. By leaving the rub on the meat for a long time, it will absorb deeper into the meat. This isn't necessary, but it does help. It is possible to apply the rub and put it straight on the smoker. Injecting Brisket. Regarding BBQ Inc.
Because a brisket is so thick, it is a good idea to get the flavor and extra moisture deep into the meat. To do this, it is important that you know where the meat is. This is why it was necessary that you started this project by both examining and getting a feel for the brisket. An injection marinade is a thin solution that is placed into a meat injector. It is important to make sure that the marinade will pass through the needle. There are several brisket marinades that you can use or you can simply take some of the rub you used earlier and mix it with equal portions of oil, water, and vinegar. I suggest you use a good quality oil and cider vinegar. Load the marinade into your injector and inject it into the meaty portions of the brisket every inch. Use small amounts. Injecting too much will simply cause it to leak out as the meat contracts from the heat. It is best that you do this injection right before you place the beef brisket on the smoker. If you do it before you refrigerate the drop in the temperature of the meat will cause the marinade to push out overnight. You can save the remaining injection marinade to use as a mop later on. Continue to 6 of 12 below. Brisket on Smoker. Regarding BBQ Inc.
With the beef brisket ready, it's time to get the smoker ready. You will need a lot of fuel because the smoking process takes a long time. What I do is nearly fill the firebox on the smoker with good lump charcoal. Then I pour in a chimney full of burning charcoal. This fire will spread through the charcoal slowly keeping the smoker hot for a long time. Of course, knowing your smoker well is the secret to success. Adjust the smoker to hold a temperature around 225 degrees F (110 degrees C), for the entire cooking time. Remember that the brisket needs to cook anywhere between 1 1/2 to 1 hour per pound. Not all briskets are created equally, so the cooking time will vary. Also, the wind, outside temperature, and humidity plays a big part in cooking times, so be prepared to adjust accordingly. As for the smoke, it is more important that you have a good supply early. When the brisket first goes on you want to add wood to generate smoke. Meat absorbs less smoke the more cooked it gets so most of the smoke flavor will enter the meat in the first two hours rather than the last four. Even heating is vital to get your brisket cooked through properly. This is why it is vitally important to know your smoker well. Depending on the placement of the smoker's firebox you may need to rotate the brisket so that it cooks evenly. Also, you may want to flip your brisket. This is important if the brisket heats from the bottom as you don't want the bottom burning. Once the brisket is placed on the smoker, make sure there is good airflow around all sides. This will give an even smoke contact. Also, when you put the brisket on the smoker rack, push it together from all sides. As meat cooks, it shrinks. Failure to compact the meat might cause it to stretch out on the smoker rendering a tough or dried out brisket. If the smoker heats to the side, I recommend placing the brisket fat side up. If your smoker heats from below, then I suggest you place the brisket fat side down (see Brisket - Fat Side Up/Fat Side Down?). Continue to 7 of 12 below. Turning Brisket. Regarding BBQ Inc. It is best not to move the brisket too often. I recommend that if you need to rotate or flip the brisket that you do so no more than every two hours. When you do move your brisket it is a good time to apply some mop (or baste) to the meat to replace any moisture lost during moving. Knowing your smoker is very important. Most meat smokers have even heat, but if yours does not (is hotter to one side) then rotate frequently. If the heating is even then I suggest turning and rotating once, half way through the cook time. This eliminates any unevenness in the cooker, no matter how small, and equalizes the crust formation around the brisket. It also helps to allow excess fat to drain away. Continue to 8 of 12 below. Mopping Brisket. Regarding BBQ Inc.
Mopping the brisket adds moisture to the surface, but most importantly, flavor. This is best done during the second half of the smoking time. A simple way to make a mop is to take some of the rub used to flavor the brisket and add water, oil, and vinegar. A good mop should be running. This is not a thick barbecue sauce, but a watery layer of flavor. Mopping several times will allow these flavors to build up into the crusty surface of the meat. To allow the crust to form, avoid mopping in the last hour of the cook time. I also recommend that the mop be warm. a cold mop will slow the cooking process. Use a mop that is heated to about 140 degrees F/60 degrees C. The mop should neither cool nor heat the meat. Brisket Temperature Check. Regarding BBQ Inc. The brisket has been cooking for many hours and now you are starting to wonder when it will be ready. That means it is time to check the temperature. Because of the mixed meat and fat structure of the brisket this isn't as straightforward as you might think. Fat heats faster than meat so you might find that the internal temperature of your brisket is very different depending on where you take your reading. You need to take the temperature in several places, aiming for a thick piece of meat. Use a reliable, fast read meat thermometer. You should be able to feel the difference between the fat and the meat as you insert the probe. By this point, the fat is about as solid as warm butter. The meat, on the other hand, should give some resistance as you insert the probe. Look for an internal temperature above 175 degrees F/80 degrees C. This is beyond well done for beef, but still too cool for a good brisket. Ultimately, you're looking for a temperature above 185 degrees F/85 degrees C, so once it reaches 175, it's time to wrap the brisket in a heavy layer of foil and remove it from the smoker. Continue to 10 of 12 below. Wrapped Brisket. Regarding BBQ Inc.
Once the brisket nears completion, it is time to lock in the remaining moisture and let it finish off, perfecting tenderness without drying out. To do this, you need to wrap the brisket in aluminum foil as tight as you can, keeping it warm and allowing the internal temperature continue rising. What you are aiming for is a uniform temperature throughout the brisket around 185 degrees F/85 degrees C. Since the surface and the fat are much hotter than the center of the brisket all you need to do is keep the brisket warm to let that heat continue cooking the center. This can be done in a number of ways. Competition cooks will place their brisket(s) in a cooler to hold in the heat. You can take your wrapped brisket and secure it in a heavy towel to hold in the heat. I put my wrapped brisket back on the smoker and close down all the vents to put out the fire. The smoker will remain warm enough to continue the process but won't add too much additional heat which can cause the brisket to overcook. Let the brisket continue in this way for 30 minutes to an hour before checking the internal temperature again. Once you reach 185 degrees F/85 degrees C your brisket is cooked and rested. Continue to 11 of 12 below. Carving Brisket. Regarding BBQ Inc. Carving a brisket is more of an art than a science. In other words, it requires experience more than technique. If you go slow and watch what you are cutting, you shouldn't have much trouble getting a large number of good slices just perfect for serving. Start by cutting back the fat layer on the top of the brisket to expose the meat. Then working from the thin, square end of the brisket, cut long thin slices about the thickness of a pencil. If you find that the brisket is a little tough, cut it thinner. If the brisket starts to fall apart cut the slices thicker. As you work your way along, trim off any large pieces of fat. Once you get to the point end of the brisket you will find a second layer of meat on the top. You should now be able to see the strip of fat that divides these two parts. Cut through this fat removing the point from the flat. The grain of the point runs differently from the flat so it needs to be cut in the other direction. With practice you shouldn't have any trouble carving a brisket and, after all, the meat is so good, few people will mind if it isn't cut to win a competition. Continue to 12 of 12 below. Sliced Brisket. Regarding BBQ Inc. Traditionally, smoked brisket is served hot on a plate. Frequently it makes its way into sandwiches. A sauce is always optional with brisket, but if you are so inclined I know of a number of great brisket barbecue sauces. This is such a wonderful meal that it really holds up all by itself, but you can top with fresh chopped onions and serve with pickles to round it out. Smoked brisket also makes a fantastic ingredient in so many dishes. If you happen to have leftovers, try adding it to any recipe that uses beef. This makes a great chili, taco, or omelet. I have cooked up whole briskets, just for the leftovers. If you are not going to be eating it in the next day or two, it is best to vacuum seal leftover brisket and freeze. If will stay good this way for several months and can be reheated by placing the sealed back in boiling water for about 20 minutes. By reheating this way, the smoke flavor is better retained. This barbecued brisket is so easy, we call it the lazy man's version.